This is simple although, again, not apparent if you are new to the Android OS and to smart phones in general. 1. Go into Contacts or into your Phone application. 2. Find the person you wish to text or call. 3. Swipe to the left to text. 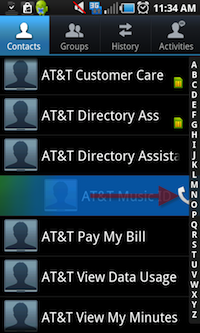 As you swipe the contact will turn a yellowish-orange and the texting application will open up. 4. Swipe to the right to make a call. As you swipe the contact will turn green and the phone app will make the call.